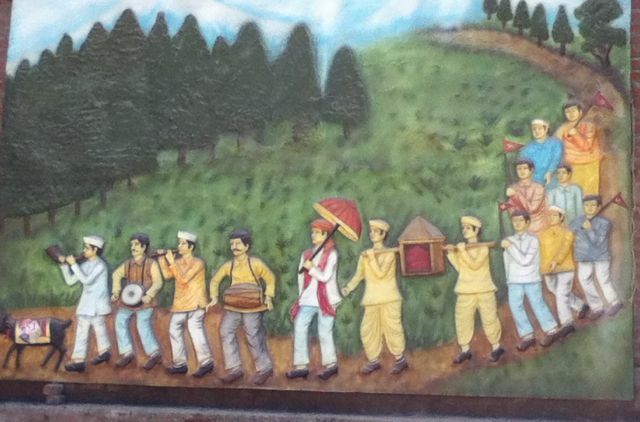 Yes, on Sunday we walked to the bazaar. Up from our house to the New Road, across toward the school residences, then up the old Dhobi Ghat path to Cozy Korner, just below Woodstock Villa. From there the path was the usual, along Tehri Road to Mullingar, and through the bazaar. We went back to Agarwal's Vegetarian where we ate, then up Kulri Hill to Broadway Optical, where my new glasses had arrived. When I tried them on I was quite disoriented, but the manager assured me I would get used to them. After we were home, I tried them again and realized that they were badly wrong. I think that the prescriptions were switched between my eyes; they are definitely better if I look through the opposite lens. So a trip back (probably by scooter) is in the cards. 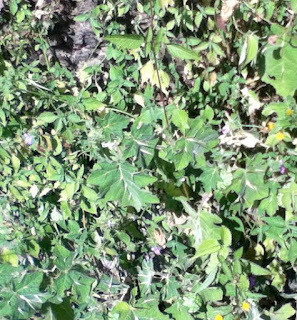 Along the New Road, I was looking for the stinging nettle and dak leaves, which are quite common. I saw this plant, which I've never seen before. The nice big leaves are covered with sharp thorns! 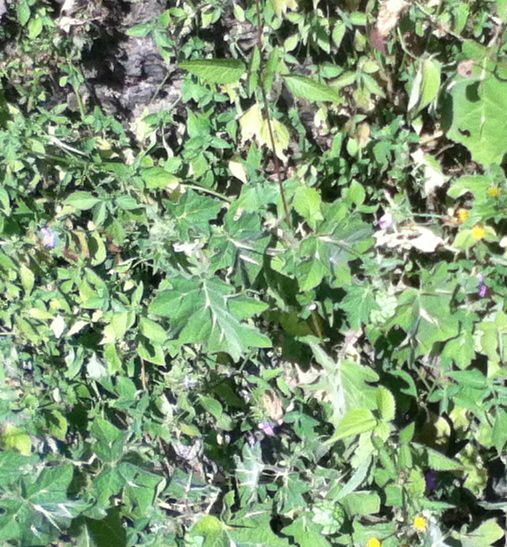 It is a bit hard to see, but this plant has great natural protection! A sharp curve below Cozy Korner. 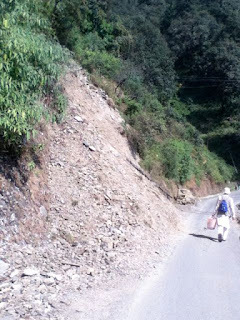 This was the old Dhobi Ghat Road that was slightly motorable in the old days before the New Road was built in the late 1970s. 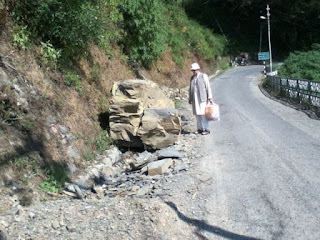 But now there are steps at the top (Tehri Road) and bottom (New Road). Part of it is nicely paved, like this; part is stony and not so nice. The following photo shows a landslide just west of Woodstock Villa. This is a common sight during and after the monsoon. 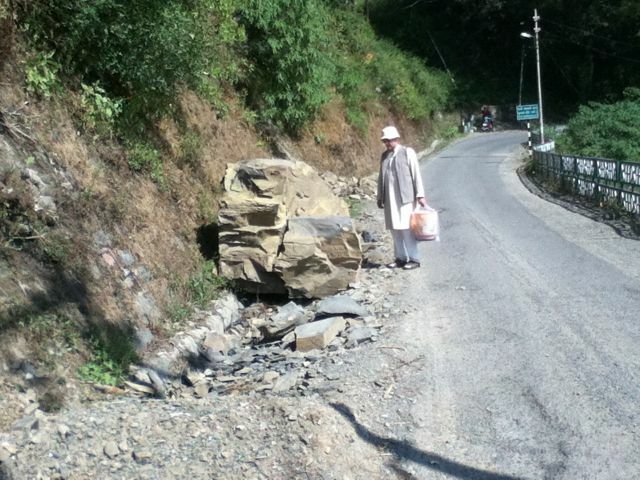 One of the large rocks that came down in the landslide shown above. It has been moved slightly away from the rest so the road is still passable. Dan is standing beside it to show the size. 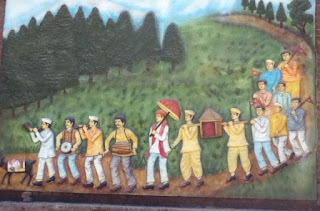 A new sight in town is several bas-relief painted murals. 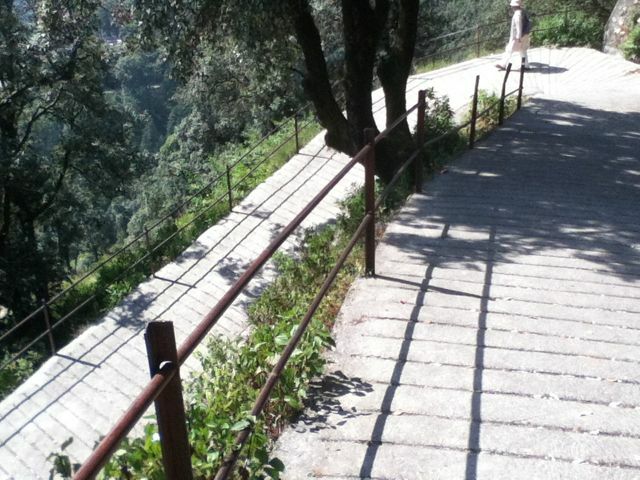 This one is on the hill going up to Landour from Picture Palace. 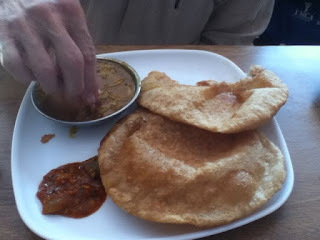 I've posted this before, but here are the poories and potato curry we had for Sunday brunch. 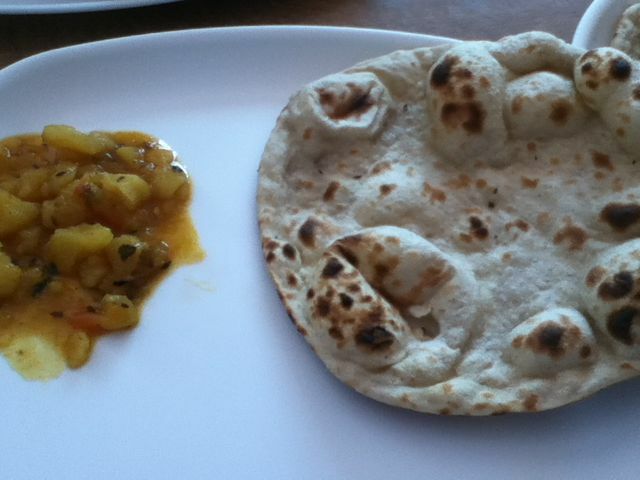 As much as I love poories, I decided to have tandoori roti instead. Delicious and no grease at all! The State Bank of India is a landmark at the top of Kulri Hill. 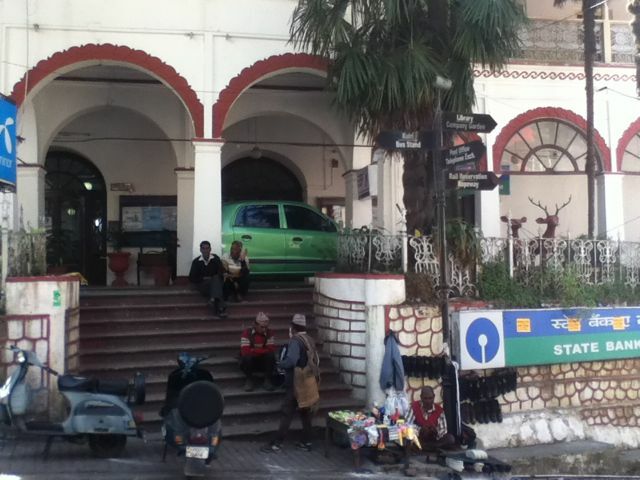 As I was standing near the bookstore waiting for Dan to buy a paper, I noticed that the veranda is being used for parking! Off to the left there is a ramp up from the road. The proliferation of vehicles here is quite amazing; they are everywhere, parked in every conceivable place, and some not so conceivable. The entire walk, with stops for lunch, picking up eyeglasses, a bit of shopping, picking up shoes from the mochi (shoemaker and repair), and a bit of a rest for me at the top of Mullingar on the way back, took three hours and fifteen minutes. I did well, but was happy to hang out at home the rest of the day! Landslides...if you look at pictures of Parker Hall before 1949 you see a different front. A huge slide sometime between 1950-51 required a whole new front yard and approach to the building from the road down. Fortunately the slide didn't dump on Parker Hall itself. I was there the morning after and remember the consternation.